Long range safe flights with telemetry and professional benefits. Compatible with XLRS D1, D2, D3 and D4 systems. Professional Receiver of long range for flights EVLOS, BVLOS and NLOS. 200Km or more depending on antennas and installation, with Mavlink telemetry and radio modem (Data Link) transparent of 38.4kb to 100kb. Control 16 servos distributed between 8 PPM outputs and 1 SPPM configurable of 8 to 16 servos. Last technology of radio of 5th generation of long range of DMD, -116dBm of sensitivity and 1000mW of power for telemetry. The most powerful receiver and of greater range that will provide you distant flight with the security of a good radio link. *EVLOS: Extended Visual Line Of Sight operations. AES encription in RF (Optional). Fixing with adhesive or 4 screws in the base. 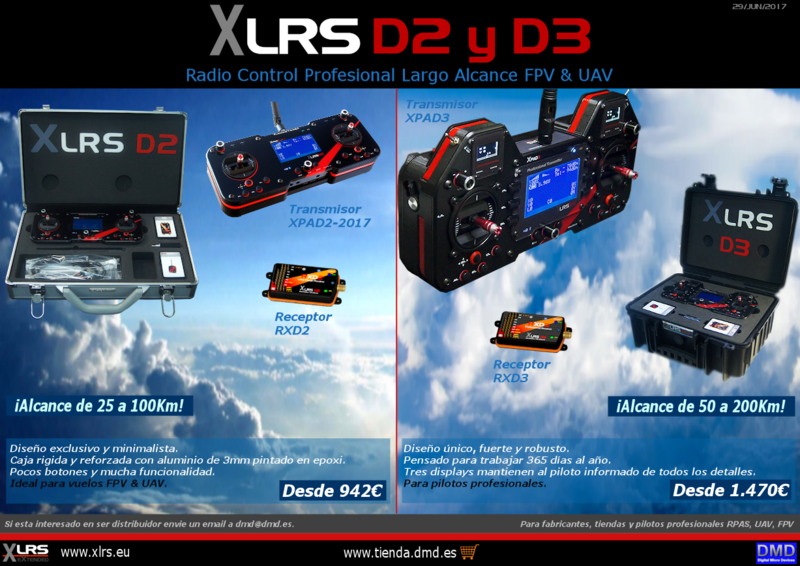 Compatibility with XLRS systems D1, D2, D3, D4 and replaces previous versions RMD1, RXD2 and RXD3. Redundant: You can use 2 redundant receivers (Optionally with different frequency bands) to increase security and effective range. Repeater: Increase range or coverage for NLOS flights or behind mountains and large obstacles. You can receive XLRS repeater data on the ground or in flight from another drone or plane (Consult).  Built-in advanced micer: The configuration of the mixes, activation of buttons and assignment of encoders are made in the receiver and not in the RC Transmitter as is usual in RC systems for amateurs, this translates into immediate improvements and reduction of errors since it doesn’t need to memorize nor select the model, there isn’t limit of models per transmitter and the controls are always adjusted and trimmed. This incredible receiver is capable of using and mixing up to 48 buttons or switches, 4 joysticks, 4 encoders, 4 sliders, 8 microjoys equivalent to the inputs data of 2 transmitters, one for the pilot and one for the co-pilot or observer. Note: Mixes in the receiver apply to the XLRS systems D2, D3 and D4. No to D1. In the D1 system, when operating with a standard RC transmitter, the mixes are done in the traditional way in the RC transmitter and not in the receiver. 8 multifunction outputs for servos, 1.5mSeg +- 500uSeg (100%) standard RC. Configurable up to +-1000uSeg (200%) to increase the servo offset if necessary. SPPM 8-16 channels Serial PPM or CPPM output of servos, to connect the autopilot input and/or an RC channel expander (Converter 1 SPPM to 8 or 16 PPM channels). RBcus. TTL serial port interface (3.3V) for Radio Control devices with RCBus protocol of DMD. You only need a standard servo connector with 3 pins (0V, 5V and data). Typical speed: 115.200b, 8, N, used to connect with the XOSD or similar and extension peripherals such as servo extenders, power output actuators and power servo controllers in large UAVs where the servos can be up to 6 meters or more of the receiver. Modem. Mavlink Telemetry. TTL serial port (3.3V) with transparent protocol (Data Link) compatible with Mavlink protocol. Configurable speed from 9.600b to 115.200b, default: 38,400b, 8, N.
USB. Micro-B. ESD protected and filtered. For configuration and connection to PC through DMDStudio software. The USB doesn’t feed the servos so asn’t to overload the USB of the PC. I2C. I2C bus for future expansions. SMA-Female. Robust connection for the radio antenna. LED RF. Indicates RF Transmission activity (telemetry). LED Link RF. Indicates RF reception activity or link (RC or radio modem data). Servo output with current and voltage limitation. ESD (static discharges) in servo outputs, serial port and RCBus (communications). Redundant receiver: 2nd receiver that will serve to increase the safety, quality and effective reach of the radio system. It will also expand the MIXer as it has independent mixes and control of 16 additional servos adding 32 servos in total. Remember that XLRS isn’t limited to traditional RC channels, the number of servos in the system isn’t limited, you can use 32, 64 or more servos if you need it. Servo Extender: Extension to connect 16 additional servos with independent mixes. It connects to the RCBus and allows better extension and ordering of connections to groups of local servos in large UAVs. Servo Controller: Connects to the RCBus (Option RS485) to extend the data connections of power servos in large UAVs with total safety, feeding them directly from the power system. It controls the local voltage of the servo, converts the high battery voltage (for example: 24V to 7V) to the power required by the servo, consumption control, servo test, etc. RC Channel expander: It connects to the SPPM output (it can be in parallel with the SPPM input of the autopilot) and allows to economically expand the 16 servos of the receiver. They are standard and economic modules in the market. Extraordinary Range of professional Radio Control and telemetry in the ISM free band. 200Km or more depending on the installation and conditions. internal Radiomodem (Data Link) with MAVLINK protocol and transparent. Interface: TTL serial port to 38.400b configurable from 9.600b up to 115.200b. Compatible With autopilots Pixhawk, APM, etc and software: Mission Planner, QGroundcontrol, etc. DMDStudio is the configuration and utilities software for all XLRS systems in Windows environment. The same software is used for all XLRS devices. Once you learn how to configure or update a device, you can configure almost all devices, except for the differences of each device. Update firmware of the device, accesing the BOOT tab (DS/SYS/BOOT).